O.k. Let’s start looking at the various available charting packages, two at a time. Again, I’m not doing a full-on evaluation and comparison of every available capability. In particular I’m ignoring the import/translate capability that people use to turn standard graphics and photos into cross stitch designs. I’m looking at just one aspect of these tools – charting complex double running stitch patterns. PROS: First off, you can’t beat the price for this one. It’s freeware, no registration required. It presents output in both graphed and stitch simulated formats, and includes a DMC-based thread palette. 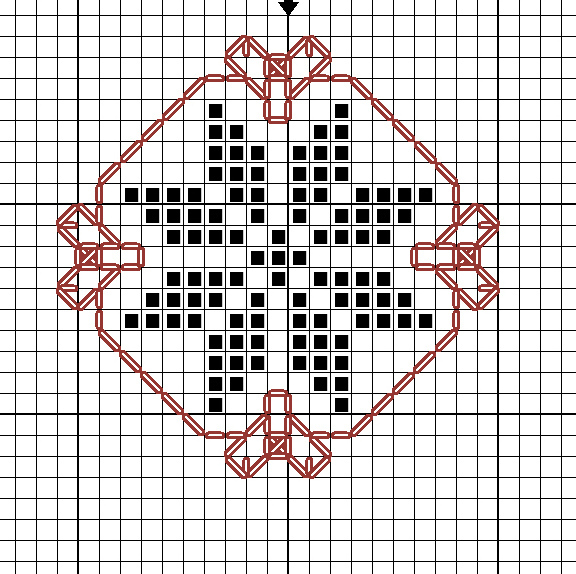 The program is optimized for cross stitch, but it does contain a back stitch option that allows drawing straight stitches. Standard ouput in in-program composition mode appears to max out at 73×73 per printed page but mesh size can be manipulated to present more units per page (reducing down as far as legibility will permit and then some. Prints to paper (and PDF if a PDF writer is installed) and exports to JPG, PNG, TIFF, TGA, PCX, JPG-2000 and as pixel only to make icons. CONS: Backstitch doesn’t present on screen in either mode as a series of countable, identifiable units. Yes, you can count the boxes over which the stitches travel, but that can be difficult, especially in low light or in dense patterns. While back stitch clusters can be selected and moved, inverting or mirroring them introduces errors – the replicated units don’t look like the original (plus transformation). Multiple page works are presented without repeats/overlaps for cross page orientation. Zoom is constrained to 8 set levels. VERDICT: An excellent value for the casual cross-stitch user who wants to create multicolor block unit patterns and who may want to use the occasional outline or straight stitch unit. Not very useful to anyone composing entirely in double running. PROS: Back stitch and straight stitch have symbol sets that can be manipulated to display individual stitches (see settings in screen shot below). Units can be selected as part of a rectangular block or “lassoed” as a non-standard shape (Pro version only) and the selected or pasted bit can be mirrored/flipped/rotated with no loss of relationship among constituent units. Stitches can be represented on screen in floss-strand equivalent thickness units, and different stitches can use different thicknesses of thread. The thickness backstitch and straight stitch symbol representations can exist independent of floss thickness Output can be printed to hard copy, and mesh size can be manipulated to present as many per page as are legible. A dizzying array of available colors from most major floss and thread makers is included. CONS: To show stitches as individual units, back and straight stitches need to be drawn one at a time. You can’t paint a line of them across multiple chart blocks and have each one neatly display as a separate unit. I can’t figure out how to display both cross stitch and line stitch symbols on the same view (I’d like to be able to show the line stitch units from the left hand picture and the color x units from the center pix on the same final image. Freehand “lasso” selection and export to JPG, TFF and other standard graphics formats are only available on the Pro version (JPG export shown in right image). The Pro version costs $120. US. The four day trial is a pain (those of us with careers may not have four linear days in which to make an adequate assessment of both versions). VERDICT: A possibility, but pricey. Need to test it on a really complex bit of charting. I’d appreciate hearing from others who are using any of these (or other) dedicated charting programs or who may be bending general purpose graphics programs to this need. Love a program? Have problems with one? Have hints/clues/insight into features/limitations? I’m sure that others would love to know, too.